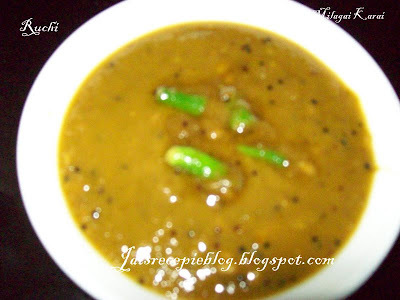 You are bored with Milagai podi, chutney,Onion chutney, tomato thokku for idli, dosa then you try this Hot , spicy, tangy ,sweet such a spicy chutney named Milagai karai. You can say chutney, thogaiyal or pickle.. This Milagai karai is our family favorite,.Its easy and quick to make and tastes so yummy with Idli, dosa and curd rice. Grind few chillies with salt and keep aside. In a pan heat oil, add the mustard seeds, when they start to splutter add the split green chilies and grinded chilies saute till they start to blacken. Then add the thick tamarind pulp, turmeric powder asafoetida and bring it to a boil.Once the chillies flavor started coming add the jaggery let it boil for a few minute and switch off the heat.Then Stir well and store in a bottle. Without refrigeration it will be for 3to 4 days. This pickle can take along with Idli, Dosa,&curd rice..
hi jaishree, that's a really yummy recipe. easy to make too. thanks for reminding me.. its tempting and mouthwatering dear. this sure is spicy.. perfect for spice lovers! sounds very yummy. good one..Cooking in tamarind will not make the pickle too hot..isn't it..will try it..
New to me! I will love this with dosas and idly! Wooooow, haiyoo, my taste buds started to crave for that...This is not fair to tempt me like this.. Sounds like mirchi ki salan to me...we too make it in the similar style, very hot+tangy, right. For cold weather like this...yummm! Woww drooling over this spicy chilli pickle...delicious n congrats on ur award , wish u more in future..
Green chilli pickle makes me drooling. A typical side dish for idly / dosa that is not fermented long. That looks spicy and delicious! Makes a nice side dish. Looks spicy and delicious ! Came here after reading Vidhya's interview and what she has told is ture Jaishree. You have very interesting and new recipes. I'm going to try this green chilli pickle definitely. Good one. Love this puli mologai. My Grandma used to prepare this so well. Thank you asha, malar, priya, gita, viki, anu, rekha,trupti priyanka, deesha, vibas, vidhas, sri all for your lovely comments.Nice to know u all like it. Oh, this sounds yummy....I must try this out!